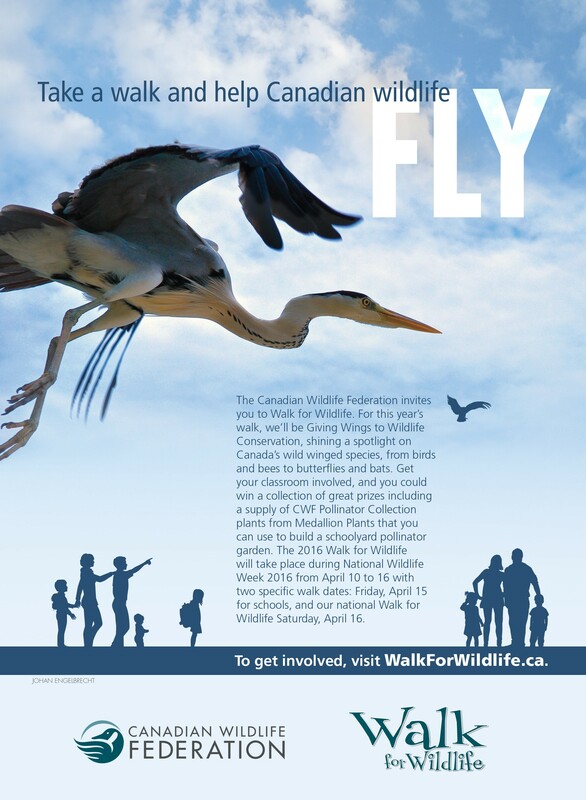 OTTAWA, ON--(Marketwired - March 23, 2016) - The Canadian Wildlife Federation (CWF) is asking the public to step forward for the protection of winged species like butterflies, birds, bats and bees by walking for wildlife during National Wildlife Week April 15 and 16. The CWF Walk for Wildlife is a national campaign that encourages all Canadians to get outside and experience the wildlife and natural spaces that define Canada. Register your school or take part as an individual. Walks organized by participating schools across the country will be held Friday, April 15 while the general public Walk for Wildlife is Saturday, April 16. This year's theme is "Giving Wings to Wildlife Conservation," shining a spotlight on the issues facing Canada's wild winged species, from birds and bees to butterflies and bats. "There is no fee to participate and all funds raised will help support critical programs to conserve wildlife," said Rick Bates, Acting CEO of CWF. "There are also some great prizes to add to the natural benefits of getting outside." The top qualifying school fundraiser will win a pollinator garden while the top qualifying individual fundraiser will win a laptop. The first people to register will receive a creamy avocado eye treatment from Kiehl's. This is the sixth year of CWF's Walk for Wildlife campaign but the first time the focus has been on wildlife with wings. The theme was chosen because many winged wildlife are at risk. As well, 2016 marks the 100th anniversary of the migratory birds convention between Canada and the United States, which was one of the first international treaties to save wildlife. The Walk For Wildlife is one component of a comprehensive National Wildlife Week program which also includes Bird Impact Reduction Day April 12, a Wild Art show and sale featuring the works of Olivia Mew and Geddy Lee and an Adopt an Animal program. For more information visit NationalWildlifeWeek.com. The Canadian Wildlife Federation is dedicated to fostering awareness and appreciation of our natural world. By spreading knowledge of human impacts on the environment, sponsoring research, promoting the sustainable use of natural resources, recommending legislative changes and co-operating with like-minded partners, CWF encourages a future in which Canadians can live in harmony with nature. Visit CanadianWildlifeFederation.ca for more information. National Wildlife Week was established in 1947 to commemorate the achievements and contributions of Jack Miner, one of the first conservationists to determine the migratory paths of North American birds. Visit NationalWildlifeWeek.com for more information of the annual celebration, which always includes April 10 in honour of the birthdate of Jack Miner.